The first mention we have of these three martyrs who died around 258 A.D. comes in the sixth century in the writings of Saint Gregory of Tours. Denis (or Dionysius as he is also called) is the most famous of the three. Born and raised in Italy, he was sent as a missionary to Gaul (now France) circa 250 A.D. by Pope St. Clement along with five other bishops. Denis made his base of missionary activity an island in the Seine near the city of Lutetia Parisorium -- what would become Paris. For this reason he is know as the first bishop of Paris and the Apostle of France. There he was captured by the Parisians along with Rusticus and Eleutherius. Later writers have referred to these as Denis' priest and deacon, or his deacon and subdeacon, but we have no further information on them. After a long imprisonment and several aborted executions, the three martyrs were beheaded with a sword and their bodies were thrown into the river. Denis' body was retrieved from the Seine by his converts and buried. The chapel that was built over his tomb grew into the abbey of Saint-Denis. In the ninth century, Denis' story and identity became fused and confused with Dionysius the Areopagite and Pseudo-Dionysius, but later scholarship has re-established his identity as a separate saint. 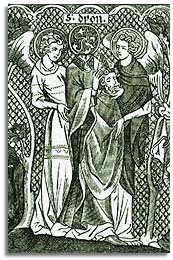 Denis is pictured as he was martyred -- headless (with a vine growing over the neck) and carrying his own mitred head. Recognized since the time of St. Gregory as a special saint of Paris, Denis is the patron saint of France.